The phenomenon has particular dangers for the Church. Not only does the Church need men to replenish the ranks of the clergy, but in general fathers appear to be markedly more influential than mothers in passing on the Faith to their children. The simplest explanation for this may be the father’s greater association with the adult world, which children seek to join as they grow up. In manifesting and in living on earth God’s own fatherhood (cf. Eph 3:15), you are called to guarantee the personal development of all members of the family, which is the cradle and most effective means for humanizing society, and the place of encounter for different generations. It is therefore very significant that the ratio of men and women attending the Extraordinary Form tends to be more favourable to men, a fact which has not yet caught the attention of professional researchers, but can easily be verified by casual observation. Appealing for observations from around the world, the FIUV has found nothing to contradict the accuracy and world-wide applicability (in the Latin Rite) of the figure noted above, of about 37% of Ordinary Form congregations being male. At the Extraordinary Form, a figure of about 55% appears to be typical, in a range from 50% to 75%. Women outnumber men in most Protestant congregations throughout the West, and there is evidence of this being a long-term characteristic of many Protestant denominations. In other religions, however, this is not so. The balance in the Catholic Church in the United States as recently as 1974 has already been noted. Orthodox Judaism and Islam appear to attract more men than women, even in the West; Eastern Orthodoxy seems to attract a balanced group of Western converts. The imbalance in the Catholic Church in the West of today demands special explanation. [A]mongst Catholics emotionalism and even strong sentiment is considerably discouraged, and … the heart of religion is thought rather to reside in the adherence and obedience of the will. The result is, of course, that persons of a comparatively undevout nature will, as Catholics, continue to practice their religion, and sometimes, in ungenerous characters, only the barest minimum of their obligations; whereas as Anglicans they would give it up altogether. Benson related this to the balance between the sexes, and testified that, if anything, more men than women were to be seen at Catholic services in his own experience. Even more central to masculine worship is the notion of the Transcendent. In deemphasizing in recent generations a concern with absolutes and ultimates, heaven and hell, and eternity and infinity, modern Christianity has taken a decisive turn towards feminine religion, which is typically interested in the immanent and the incarnational, in finding God in the small things, the everyday, and the mundane. … As liberal religion stresses increasingly the immanent and “horizontal” dimension of faith to the exclusion of the transcendent and “vertical” reality, it inadvertently ignores the voracious appetite of men for the Great, the Wholly Other, and the Eternal. A liturgy that appeals to men possesses a quality the Hebrews called kabod (‘glory’) and the Romans gravitas (‘gravity’); both words at root means ‘weightiness’ and connote a sense of dignified importance and seriousness. While there may be other factors, approaching the question in this way appears to explain the variable success of different religions in attracting and retaining men. Orthodox Judaism, Islam, and Eastern Orthodoxy have, either in theology or liturgy, or in some combination of both, an emphasis on the transcendent and the mysterious, and on formal ritual. Protestant denominations with a more liberal theology and informal liturgy tend to have proportionately greater problems retaining men, and liberal Judaism is less successful than Orthodox Judaism. The success of the Extraordinary Form in attracting and retaining men fits into this wider pattern. The sacral formality and lack of spontaneity of the Extraordinary Form, its orientation to the transcendent, and its expression of profound truths without demanding an openly expressed verbal or emotional response from the congregation, are features which do not make demands upon men with which they are uncomfortable. At the same time, they provide something particularly attractive to men: the expression of ideas through action, the drama of the ceremonies. 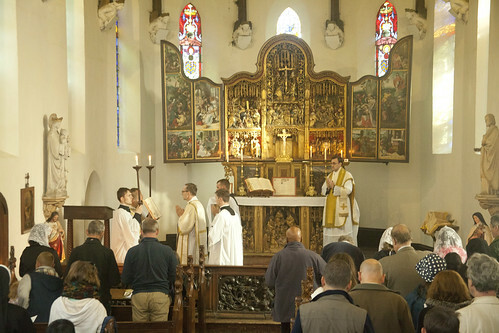 The content of the ritual, and of many of the liturgical texts, further stresses the transcendent, the sacrificial nature of the Mass, and the necessity of reverence before Christ made present upon the Altar. Finally, it provides men with the kind of challenge with which they are comfortable, indeed can find attractive: the call to a conversion of life, in the context of a clear expression of the reality of sin and the need for grace. It is useful to note a related remark by John, Cardinal Heenan about an early version of the reformed Mass demonstrated in 1967. 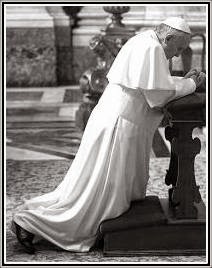 At home, it is not only women and children but also fathers of families and young men who come regularly to Mass. If we were to offer them the kind of ceremony we saw yesterday in the Sistine Chapel [a demonstration of the Normative Mass] we would soon be left with a congregation mostly of women and children. 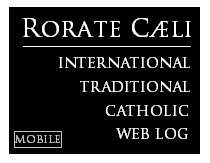 The Extraordinary Form of the Roman Rite is, moreover, commonly associated with an interest in and practice of many traditional devotions, to a greater extent than in the rest of the Latin Church, devotions which can also be attractive to men. The most striking example of these is the walking pilgrimage, which has been taken up by Catholics attached to the Extraordinary Form in many countries, inspired by the success of the annual pilgrimage from Paris to Chartres organised by Notre Dame de Chretianité, in which 8,000-10,000 people regularly take part. The physical challenge of a long walking pilgrimage—the pilgrims of the Chartres Pilgrimage cover 100km in three days—is a particular draw to men, and also to the young. In this respect Catholics attached to the Extraordinary Form are again responding to a wider phenomenon, which has seen the number of people tackling the even longer road to Santiago de Compostella—many with little or no religious faith—increase enormously in recent decades. The spiritual need of these ‘pilgrims’, taking the term in a wide sense, is addressed by the physicality of many traditional devotions. The features of the Extraordinary Form attractive to men are not, necessarily, unattractive to women. While it seems natural to describe certain liturgical tendencies, such as emotionalism, creativity, spontaneity, and an emphasis on the community, as ‘feminine’, it does not follow necessarily that women want to see these features incorporated into their worship. What does seem to be the case, however, is that as a religion moves in the direction of the ‘feminine’, understood in this way, this causes particular problems for the retention of men. I encourage Catholic men, within their families, to make a real contribution to the human and Christian upbringing of their children, and to the welcoming and protection of life from the moment of conception. I invite them to adopt a Christian style of life, rooted and grounded in love (cf. Eph 3:17). With Saint Paul, I exhort them once more: “Love your wives, as Christ loved the Church and gave himself up for her ... husbands should love their wives as their own bodies. He who loves his wife loves himself. For no man ever hates his own flesh, but nourishes and cherishes it, as Christ does the Church” (Eph 5:25, 28). Statistics reported in the National Catholic Reporter: ‘Losing their religion’ by Cathy Lynn Grossman, 20th February 2015; research was published by the Centre of Research in the Apostolate (CARA), based in Georgetown in the United States. Gallup Poll of Catholics (2005), Question 75. David C. Leege and Thomas A. Tozzolo “Participation in Catholic Parish Life: Religious Rites and Parish Activities in the 1980s” Notre Dame Study of Catholic Parish Life, 3 (1985) p14. A parallel and easily observed issue is the relative unwillingness of men to submit their medical problems to doctors. ‘The crude consultation rate [of General Practice doctors in the UK] was 32% lower in men than women. ... The greatest gender gap in primary care consultations was seen among those aged between 16 and 60 years. Gender differences in consulting were higher in people from more deprived areas than among those from more affluent areas. Accounting for reproductive-related consultations diminished but did not eradicate the gender gap.’ British Medical Journal Open 2013 Health services research: “Do men consult less than women? An analysis of routinely collected UK general practice data” by Yingying Wang, Kate Hunt, Irwin Nazareth, Nick Freemantle, Irene Petersen: Abstract. See the statistics quoted in note 6 supra. Notably the Christus Rex Pilgrimage in Australia, the Walsingham Pilgrimage in England, and the Auriesville Pilgrimage in the United States. The number of pilgrims completing the Camino is recorded and the statistics are available from the mid-1980s. In 1985 there were only 690; this increased to 4,910 in 1990, 55,004 in 2000, 179,919 in 2011 (the year after a holy year, when numbers are enormously increased), and 237,886 in 2014.